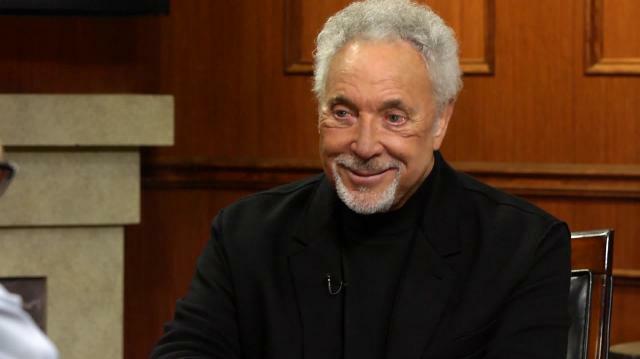 Legendary singer Sir Tom Jones discusses his storied career, new music, which new artists he'd like to collaborate with, why he chose to omit his alleged extramarital affairs from his new autobiography and the time a fan surprised him... in a bathroom stall. "She gives other singers hope, that are coming into the business.Because with electronics the way they are now, there's a lot of electrical sounding records, with autotuner...But Adele sings very much in tune." "A reporter said to me...'Would you be opposed to a DNA test? 'And I said, 'No, I wouldn't be opposed to it. 'And that was it.So now in the paper, Tom Jones is getting a DNA test to find out whether he's black or not.Well, I never said that."